Remember that one time the cable you grabbed from the box was exactly the right length for the run from patch panel to server shelf? What if every patch cable you picked up were just the right length? That's the goal of 1-year-old Austrian company PatchBox, which wants to eliminate tangles and speed up network moves, adds and changes with its system of retractable cables in rack-mountable cassettes. It's showing the product in the start-up hall at the Cebit trade show in Hanover, Germany, this week. PatchBox sells kits of 24 cassettes that slot into a 1U module just under the patchboard, right where you would usually put your horizontal cable management system. 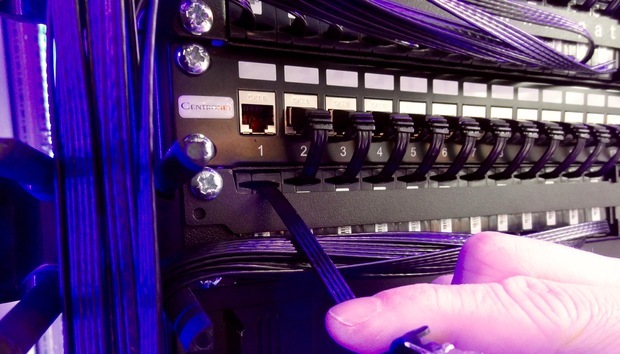 Each shelf comes with four Patch Catches -- essentially cable posts that mount on the sides of the rack, around which you can route the cables on their way between patch boards. Each cassette contains 1.3 meters (4.3 feet) of Ethernet or optical cable and a steel spring mechanism that pays out the cable to the right length. It also pulls both ends of the cable in flush against the front of the cassette when they are disconnected. The Ethernet cable is flat Cat. 6 with snagless connectors, while the optical cables come in OS2, OM3 and OM4 versions. Within the year, PatchBox expects to release another version with 2.3 meters of Cat. 6A cable, with a connector at each end of the cassette rather than both in the front. "The current version is not really suitable for data centers because of the cable length, and they need to be able to patch from front to back," said PatchBox co-founder CEO Alexander Geng. The idea for the system came to him when he was setting up racks, spending an inordinate amount of his time untangling overly long cables. You can see Geng working with the PatchBox system in this video. The company claims installations can be up to 80 percent quicker using the system. That even includes fixing the shelf to the rack, thanks to a special mounting screw: "Instead of putting the cage nut around the back, you pull it from the front so you don't get bloody fingers," said CTO Josef Hofstätter. That convenience has a price -- in this case, around €800 (US$889) for a rack of 24 Ethernet cassettes, or between €1000 and €1100 for the optical version, depending on cable type. That's a bit steep if all you want to do is tidy up the cables around the back of your PC -- instead, you could see whether that novelty retractable Ethernet cable you picked up at a trade show would do the trick. For cabling environments with a lot of moves and changes, though, the time saved will mount up, according to Hofstätter. He gave the example of a busy hotel conference center, where the network manager spends an hour or more each day reconfiguring the network to accommodate different events. In that environment, he said, a PatchBox would pay for itself within a year.